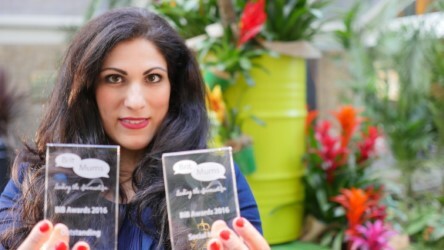 I didn’t for one moment think that I would enter BritMums Live on Saturday as a speaker and leave as a multi-award winning blogger with the Outstanding and Social Media accolades weighing down my bag! Just wow! Going up to collect my first gong, I found myself literally lost for words. Those who know me will no doubt be in utter disbelief by that but it was true. I was speechless and rambled through some thank yous! Then when the Outstanding award was read out by the brilliantly witty Carol Smilie, I felt truly overwhelmed. I did manage to find my voice for that acceptance speech and highlighted quite what makes this career so special to me-how creatively stimulating it is, how transformative it can be, how well paid and most importantly, empowering it is as digital influences work in a flexible and remote way in our own time and on our own terms, around our family. The irony of it all was finding my phone had died on me after the awards meaning I was unable to connect with anyone for 24 hours afterwards until I’d bought a new phone! …I felt, and still feel so incredibly moved by the night so thank you all so much for your votes and thank you to BritMums and the judges too. To think that more than 50,000 votes were cast across 12 categories for the awards, just amazes me. Those who follow me know that I love sharing all I know and have learnt from my years working in this field. I’ve always been transparent about my life and work as a digital influencer from the start and am committed to helping others thrive in the digital sphere too. So in that vein, I wanted to share my top 10 tips to help digital influencers raise their game. If you’re questioning whether you’re a digital influencer then believe me, even those with small audiences are coveted by brands wanting to attract niche audience- and everyone’s voice is valid and it’s easier than ever to make your blog a business if you choose to. My blog has taken me to the pages of British Vogue to Sky News broadcast to millions and beyond. I know it can be hard to feel your voice counts in what can seem an overcrowded digital space but it does. You and your point of view is utterly unique, it’s what makes you real and brings all the boys, OK, mums and dads to your yard! Always be yourself online as you are IRL and trust that you really are enough because you are! Creativity is a muscle to be exercised, be it writing or filmmaking, the more you practice, the greater and easier it will be to connect emotionally with your audience. Never stop honing your voice or skills. I remember once reading that the great Martin Scorcese still returns to his film school notes before directing every movie. Writing and creating online is liberating, it enables you to do- and be whomever you want to be. Many people, no doubt, view me as a confident blogger/woman yet they often forget it’s been nearly 6 years since I started Honest Mum. Back in November 2010, I felt rather broken after the birth of my first son, Oliver after a pregnancy that saw me suffering from pregnancy liver condition ICP and an emergency C-Section, You can read about my traumatic birth and overcoming that tough time here: ‘Being Honest-A Traumatic Birth‘. I distinctly feeling lost and alone; it was blogging which helped me rediscover my voice, channel my energy into a creative space and find greater purpose. I found BritMums at the very start of my blogging journey, they had created a welcoming, supportive and smart community and nurtured us (they still do). After 4 weeks of starting Honest Mum, I discovered I’d made the finals of the BritMums in Brilliance awards in the Fresh Category and it was a turning point for me. It made me feel my voice mattered, that people cared about what I had to say. That nod gave me the confidence to get back on set as a director and eventually become a full time blogger. Never forget that each small step leads to the next. Every success helps you feel more confident to push for the next. Please know, I still have those tough, self-critical days, everyone does, just never let it stop you from doing what you love. Write a list of all your attributes and a gratitude list to remind you of all your have to offer and be thankful for. Watch my post on SKY News on the Imposter Syndrome to inspire you to feel your most confident self. The brain is plastic, the more you practice self-confidence, the easier it becomes to believe it. Keep pushing yourself out of your comfort zone, pursuing your dreams. That is how you grow. Don’t forget that the most seemingly confident people also suffer from nerves and self-dount, they just don’t let the stress stop them. It doesn’t matter if you started your blog today or 10 years ago, you are a brand. Your blog/platforms represent you and your values. Ensure you come across professionally on both your site and social media. Make sure you are self-hosted so you can monetise if you want to. Reflect on the sites you admire (easy to navigate, captivating imagery, social media badges) and work towards doing the same on your own. It’s worth spending a little money on a designer to create a logo and customise a theme for your blog to help ensure your site looks slick but also reflect your personality. Put your goals down on paper in black and white. Nothing compares to writing your dreams down and simply GOING FOR THEM. It might sound hippy-ish but asking the universe for things really does work. I’ll give you an example of how it works. I was working with a client, Vanessa of Qwiddle, at my kitchen table discussing a dream we had. We both agreed that getting on breakfast TV would be awesome. Literally a month later on the very same day, we got a call from ITV’s Good Morning Britain asking us to feature in a series they were producing on ‘Back to School Tips‘. What are the chances of that? You could have the greatest site in the world but if no one knows about it, how will they find you/it?! It’s time to be your own best publicist, to promote yourself. Start to schedule tweets (I love Social Oomf) to share evergreen content across your platforms, to contact the press, local and national about anything newsworthy you’ve written about or have achieved…to pitch to write for BritMums or my own site and the Huffington Post-to simply push yourself and your work- creating waves about what you do! I use my media kit as a press kit too. I include latest press and collaborations along with bright imagery and logos from said PR along with my site’s reach and social media handles. I never include my fees in it and nor should you. Always negotiate based on the brief in hand and what you’re being asked to deliver. From the initial email sent to you, respond that you charge for this kind of activity and are happy to discuss in more detail. From the off, make it clear (in a polite way) that you always charge to create content/ offer PR. Be aware that there might not always be budget available and that’s OK. Simply make a decision based on whether collaborating would work in your favour in this instance. Would it offer you PR in return, will the brand promote your post on their handles, would it look good in your media kit or offer you greater experience? Think long-term. This business, like all, is about relationships. I consult for firms and have worked with many of the same people in fact across different brands and campaigns over the years. Be open, polite and come up with ideas. You are the creator, approach brands or respond to campaigns with your own unique spin on deliverables. You know your audience better than anyone and the most successful campaigns are the ones that are the most natural to you. I never work with brands I don’t believe in, use myself and wouldn’t recommend to a friend. You can see my Media Kit and Work with Me page here. I advise you pick up the phone when it comes to PRs and possible collabs, when you can. You can send emails all day long but the immediacy of actually speaking to people enables you to learn more about the brief, creates relationships and ultimately helps you to close the deal. Face-to-face meetings are even better. Be clear that you charge and work out what feels fair money-wise for your time. Be serious from the start so you’re taken seriously. Know your own worth and others will follow. When it comes to money, be open to negotiation. ask what they had in mind first and work from there. I over-deliver on every single campaign, am dependable and never miss a deadline. Remember that even if the particular campaign you’re discussing doesn’t have a big budget, the next might. PRs look after lots of clients so enquire about other upcoming campaigns and approach every job with a view that it will lead to more. Keep in touch with PRs and drop a monthly email to all of your contacts/leads saying you’re available for any suitable campaigns as they arise so you’re at the forefront of their mind when they need to commission creators. People are busy. Remind them of who you are. Don’t wait for people to come to you, be proactive and make things happen. …Most PRs are looking for well written and shot content. They will usually check your Moz ranking which lists your page and domain authority as well as your reach on your social media handles. They will also usually enquire on your stats via Google Analytics so keep track of these. PRs often hire a tiered section of bloggers for campaigns from established digital influencers to ones with smaller, niche audiences. There’s enough work for all and don’t feel you are too ‘small’ for a job. I always recommend a cross-section when I consult. You can check your ranking here. Video is booming- and it’s not going anywhere. Here are some stats if you need convincing-visitors to an e-commerce store are 64% more likely to purchase after watching a video. Visitors that view videos on a site stay an average of 2 minutes longer. Including a video in an introductory email can boost click through rate 200%”. So bloggers start filming. You should always upload content natively to platforms too for the biggest reach. Upload videos to Facebook or use Facebook Live, add short clips to instagram and of course get those films on YouTube always adding your blog urls in the description box to help SEO. YouTube is owned by Google and is the second biggest search engine so use it! You can even pin your videos on Pinterest from YT too. Start practising with your phone and get to grips with editing apps in your phone to start. I love the Canon G7X for vlogs as you can run around with it in auto without the need for an additional mike for sound. Adobe Premier Elements for beginners and Pro for when you become more advanced. You can watch my vlogs here. I don’t believe in blogging rules, that you have to find a niche to be successful or need to conform in any way. You are your niche, you can write about what you like and change your tone according to how you feel. This is your space so ‘own it’. Of course, if you want to focus on a theme, that’s great too, just don’t limit yourself if you don’t want to. I might go live 5 times on one day, once another. Go with what works for you and don’t worry about what anyone else is doing. Read my post 5 Blogging Rules to Break. When you put yourself out there, others will naturally form an opinion of you. Some will be positive, others might not be, so prepare yourself. It’s important to remember that the majority of people reading about you don’t REALLY know you, not properly, and everyone approaches people and situations based on their own unique experiences. It really is time to work on growing a thick skin, brushing off negativity and keeping those you trust close. I feel strong because those around me are. Remember a lot of people reject those they wish they were more like, so if someone dislikes you for no reason, take it as a compliment! Keep doing your thing and being yourself! Read What Other People Think Of You Is None Of Your Business. I hope these tips help both new and established bloggers to realise their worth and potential and that when it comes to creating online, the opportunities are endless. Thanks again to everyone for voting and supporting me, you’ve made my year! Previous Post #BML16 In pictures: What a great day! Great tips, and just the inspiration I needed. Thanks!